Sample from various vendors while getting your fitness on. Customers crowd the aisles at wellness pop-up. 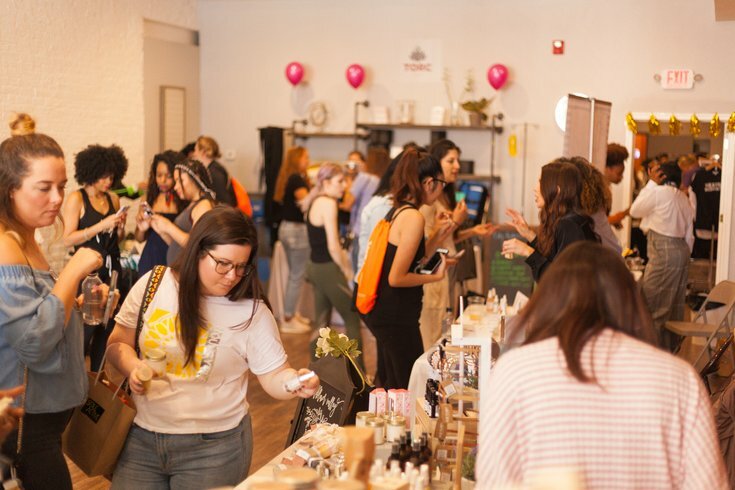 Last year, Philly PR Girl unveiled Mind, Body, and Bubbly, a pop-up fair that combined Champagne with wellness. Well, they're doing it again this year. The second annual Mind, Body, and Bubbly returns Saturday, April 13, from 11 a.m. to 2 p.m. This time the fair will be at Location 215, a newly opened event space in the Spring Arts district. In addition to featuring a large selection of fitness, beauty and wellness vendors, the event will also be collecting donations for The Hope Bag Mission, which supports non-profits that help survivors of human trafficking. Distiller Quaker City will be offering up their QC Shrubs, a lower calorie drink made with natural fruit flavors and apple cider vinegar, while Philly Natural will be handing out healthy smoothie samples and Prescription Chicken will be on hand with yogurt cups and bone broth samples. Morning cocktail will be courtesy of Naked Grouse.